Texplainer: What are the rules for poll watchers? Hey Texplainer: I hear that a poll watcher may be lingering nearby while I vote. What does Texas law say they can and cannot do? Republican presidential candidate Donald Trump is touting plans to deploy a fleet of partisan election observers to polling stations around the country to thwart efforts to "rig" the election against him and his supporters. “Help Me Stop Crooked Hillary From Rigging This Election!” pleads a volunteer sign-up form for poll watchers on the real estate mogul's website. The prospect of anyone rigging the presidential election in Texas is not a serious concern, according to Texas election officials and other experts. The state’s decentralized voting system and other protections makes large-scale voter fraud virtually impossible. Proven cases of in-person voting fraud are incredibly rare in this country, several comprehensive studies show. By far the most common form of voter fraud — involving mail-in ballots — only occurs outside of the polls and away from the eyes of any potential poll watchers. But Trump isn't alone in recruiting poll watchers this year. 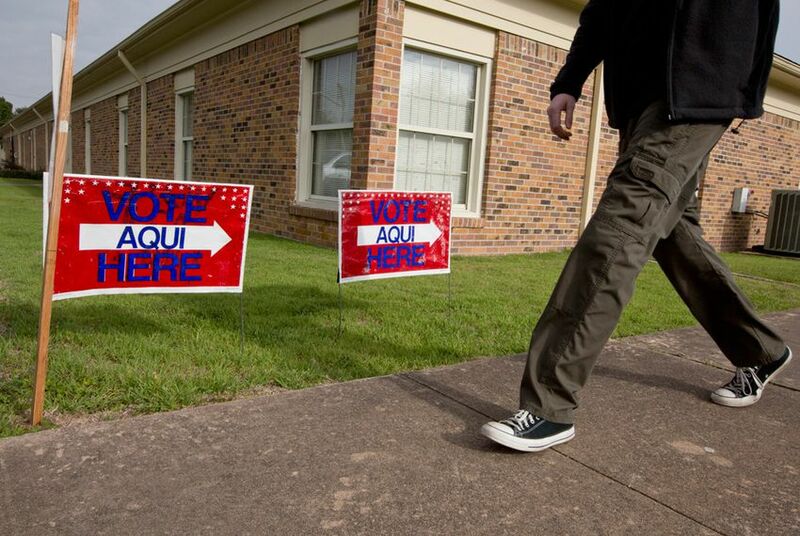 Meanwhile, several civil rights groups — including the Texas Civil Rights Project and Common Cause Texas — have joined in a broad campaign to prevent voter intimidation or misinformation. That campaign includes training its own team of poll monitors. And even an official with the Russian government recently requested to visit a Texas polling place on Election Day to study "the U.S. experience in organization of voting process." Texas denied the request. Though major recruitment efforts for poll watchers are not particularly common in Texas, poll watching itself is a longstanding practice — and it’s tightly regulated. So, what are poll watchers in Texas allowed to do? Poll watchers may look on as voters cast ballots or as officials count them. They can also observe inspection of voting machines. But they can't talk to voters or election officials unless they are reporting an irregularity to an election officer. They also can't make audio or video recordings or take photos inside a polling place. They must be eligible to vote in the county where they they are serving (or, in elections limited to a smaller jurisdictions, they must be eligible to vote in those communities). They must present a “certificate of appointment” to the election judge at a polling station, and the certificate must come from the political party, candidate or ballot measure group that appointed them (groups of registered voters may also appoint poll watchers on behalf of certain write-in candidates). They may not access a voting station while someone is casting a ballot. State law also prohibits poll watchers — or any voter, for that matter— from wearing a badge, insignia or emblem related to a candidate, measure or party on the ballot within 100 feet of a polling place’s door. Parties, candidates and campaigns may not appoint more than two watchers at each precinct polling spot, early voting ballot board meeting or central counting station. They may appoint as many as seven watchers to each early voting polling location, but no more than two may serve at the same time. Candidates on the ballot may not serve as poll watchers during their own elections. State law also bars the following from serving: current public office holders, close relatives of election judges at the polling place and people convicted of election-related offenses. Bottom Line: Poll watching is a common practice in Texas elections, but those who do it must follow plenty of rules.